The L-1049 Super Constellation first flew on July 14 1951 and though basically a stretched L-749 incorporated over 550 improvements. Only 24 of this first version were built however (for longstanding Connie operators Eastern and TWA) as it was not really a match for Douglas' superb DC-6B. The L-1049C with new engines and other improvements sold better with 48 delivered though the L-1049D freighter only sold 4 units. The next version, the L-1049E, had the payload of the D but still only sold 28 aircraft. It was to be the next version, the L-1049G (Super G), which was to finally really test the Douglas stable as with wingtip fuel tanks this type had the range to cross the Atlantic regularly. It also had optional weather radar giving the Connie a beautiful long nose. Radar was fitted to many earlier L-1049s also. The Super G first flew on December 17 1954 and over 100 were sold. The last version of the civilian Super Connie was a combi passenger/freighter variant named the L-1049H which accounted for 53 further sales. I love the Constellation it is possibly the most attractive airliner ever made (the 757 is close) though without the radar (i.e. with the short nose) it is nowhere near as nice (whilst conversely the short Connies look great with the short nose and weird with radar). The only thing that makes it look odd is on take off when the nose gear stows rearwards. There are however more than three moulds as both manufacturers have produced various versions of the Super Connie with features such as radar, tip tanks and military additions. The very earliest Aeroclassics models were on what are called generation 1 moulds and mainly decaled. A Super Connie was amongst these although only 4 model varieties were made. As with all Gen 1 Aeroclassics they are very rare nowadays and of dusbious quality. Nonetheless the Super Connie isn't that bad even with a long seam line. Dragon's Super Connie is another decent Dragon effort and you have to give them extra credit as they have produced versions with both radar (long nose) and without (short nose). In fact they are the only ones to have done an early mould representing all the pre-1954 Super G's and a good number of the total production run. You might question therefore, with this niche to themselves, why they have only used the short Connie twice! Dragon has also made several military variants including one EC-121 early warning platform with huge radar addition on the fuselage roof. One year after the Dragon mould Aeroclassics released their version. As with their short Connie the mould also captures the shape of the type well and has much superior undercarriage legs to the Dragon. Unfortunately as with the Short Connie the mould is spoiled rather by the very obvious seam line. This mould does however have no obvious join lines on the wing roots or engine cowlings which afflict the Dragon mould. 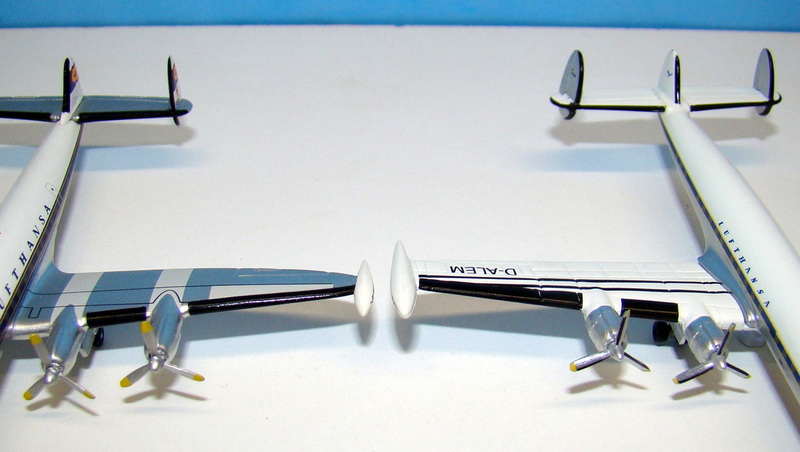 Note Aeroclassics also have versions of the mould with and without tip-tanks. Sadly they don't have a version without radar (and so with a short nose). This means they are limited to what they can show and have at times resorted to using the long nose mould for aircraft that had short noses (in the below photos the Lufthansa and Northwest are examples of this). If this bothers you be careful which you buy! 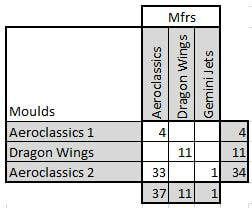 Here are some shots comparing the Aeroclassics with the Dragon. The Aeroclassics mould is superior by some distance despite the very large and obvious seam. It has a better nose, wing join, engines and undercarriage in my opinion. Note also the difference in size of the tip-tanks between the two moulds. Sadly it seems that production on the Super Connie moulds has ceased as none have been made since 2009. There is a substantial opportunity for a new short nose Super Connie mould.